The office, the family, the dinner with friends - the holiday season can certainly be a time for celebrating, and for anyone with acne-prone skin, all that partying can catch up to your complexion in no time. 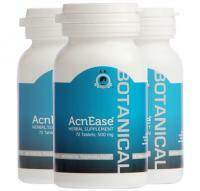 The condition of acne is due in part to a hormonal imbalance that takes place within the body. Certain hormones can affect the amount of sebum, an oily substance, produced by the sebaceous glands. When too much sebum is produced, it can clog pores. These clogged pores combined with dead skin cells and debris from the skin’s surface and bacteria is formed within the pore, often leading to inflammation or breakouts. Certain things can potentially trigger the imbalance of hormones, such as sugar and lack of sleep, while other habits can create unsavory conditions on the surface of the skin, which will often lead to a dry, flaky complexion that can contribute to the formation of acne symptoms. Read on to learn about our top three holiday party dangers to avoid, ensuring a clear and healthy complexion! Alcohol. This one might be hard for some people to hear, but those holiday drinks are not only dehydrating, but may interfere with your sleep schedule later, which can potentially lead to breakouts over time. That being said, if you can’t cut out the cocktails altogether, just try to drink in moderation or make smarter choices for your skin, like choosing wine or straight alcohol over mixed drinks high in sugar which can lead to inflammation, exacerbating acne symptoms. Red wine is preferred over white unless you have rosacea, in which case avoid red wine. Straight liquor can either be consumed as a shot or over ice, and a refreshing blend of alcohol and sparkling water is another easy way to enjoy your spirits while minimizing the impact of alcohol on your acne. Adding a dash of lime or lemon can add a healthy dose of vitamin C, an antioxidant and anti-inflammatory, which contributes to clear healthy skin. Sugar. With all the sweet foods at our fingertips during the holiday season, temptation is around almost every corner. While everyone should allow themselves to indulge from time to time, those with acne-prone complexions might find themselves paying for it on the surface of their skin for days. Many people blame their acne on sugar, and although no single food is the cause of the condition, certain things we eat, including sugar, can affect the way our bodies react. When we eat too many sugary foods, our insulin hormones kick into high gear, which many believe to be directly related to the condition of acne. That is not to say, however, that we cannot have our sweet needs met. The trick is to find alternatives to sugar as a way to sweeten your treats, such as organic honey, stevia, and coconut nectar, which all taste great and won’t wreak havoc on your complexion. Check out our guide to sugar-free alternatives for acne-prone skin for a few tasty ideas! Sleeping in your make up. Most people wash their face upon waking, but if you’re the type to fall asleep in a face full of makeup, you could be making your acne worse, and with some long nights of festive fun ahead of you, it’s important to get into the habit of washing your face before bed. Keeping a clean surface is half the battle when it comes to acne, and washing with a gentle cleanser followed by a moisturizer suited to your skin type before bed can go a long way in keeping those pores clean and unclogged, which can result in fewer breakouts. Of course, even the most skin savvy person can slip up from time to time, especially when faced with the festivities of the holiday season, which is why it’s important to have something working for you even if you let your guard down for a night or two. The most effective way to keep your skin looking and feeling its best is to prevent acne before it starts, which means breaking the acne cycle, and this is exactly what AcnEase® does. Using 100% safe, all-natural ingredients, AcnEase® works to restore the internal balance and correct the factors that cause pimples to form while treating existing pimples simultaneously, regardless of the severity of your symptoms. 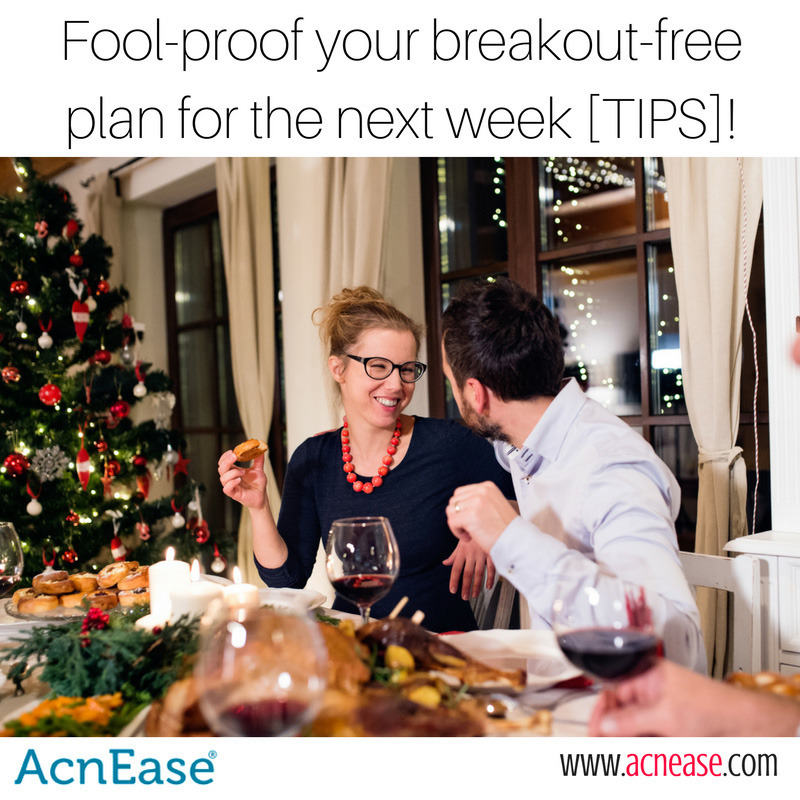 Because it is a systemic solution to treating acne, you can rest assured that it’s always working from within, whether you indulge this holiday season or not. So we want to hear from you! What are some top tips that you usually do during the next week to avoid breakouts?